Catch a glimpse to a once glorious past – a past worth visiting – as it comes alive in the architecture and fine craftsmanship of ancestral homes by doing Silay City Heritage Walk in Negros Occidental. These jewels continue to inspire awe and imagination to whoever enter its doors. These palatial dwellings, a confluence of foreign and local ingenuity, tell the tale of an era made sweeter by the sugar produced and the colorful life lived. I started this heritage walk at around 3:30 p.m. on August 29, 2013 with two of my friends, Chenie and Lindsay (and supposedly with Aileen) after (long) check-in at Ong Bun Pension House in Bacolod City. This was during my first time in Negros Occidental, the 24th province on my list. 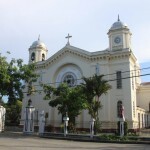 Our first stop was the San Diego Pro-Cathedral located along Rizal Street (National Road), right at the middle of Zamora and Mabini Streets. Built between the late 19th century and the pre-war years, 29 surviving ancestral houses by the sugar barons or hacienderos that spared no expense in the construction and furnishing of their homes were identified by the National Historical Commission as national treasures. Three of these structures, The Balay Negrense (Don Victor Ancestral House), Don Bernardino Jalandoni Ancestral House, and the Manuel Hofilena Heritage House were converted into museums, providing us glimpses to learn and draw from our past. 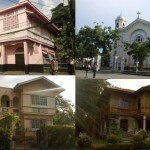 Three of these structures, The Balay Negrense (Don Victor Ancestral House), Don Bernardino Jalandoni Ancestral House, and the Manuel Hofilena Heritage House were converted into museums, providing us glimpses to learn and draw from our past. From Manila, Silay City can be reached via plane through its Bacolod-Silay International Airport (ICAO: BCD | IATA: RPVB). Silay is approximately sixty (60) minutes from Manila, about three hundred twenty (320) nautical miles. Local airline companies (Cebu Pacific, PAL Express, Tigerair Philippines, and Zest Airways) fly daily to Bacolod-Silay International Airport from their respective hubs, including Ninoy Aquino International Airport. Tigerair Philippines operate at the Terminal 4. Once at the airport, you may choose not to ride a taxi for obvious reasons and go outside the airport’s entrance (it’s to your left if you exit the arrival area) to ride a tricycle (Php10-15). From Bacolod City, ride a jeepney going to Bacolod North Terminal (Php 8) then ride a Ceres bus going to Victorias, tell the driver to drop you off at Silay (Php 15).